Use beads and simple stitches to create magnificent texture, dimension, and lifelike details on any quilt. Award-winning quilter, Thom Atkins, teaches you everything you need to know about the best supplies and techniques to get breathtaking results…plus there's a bonus tutorial on how to create a beaded bezel. Dozens of show-stopping images throughout the book illustrate the unlimited possibilities for designing your own spectacular beaded quilt. 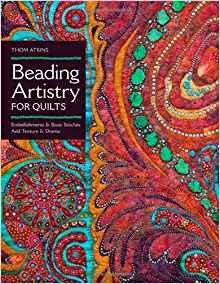 Whether you like to make traditional or art quilts, this book will help you take your fabric embellishing to a whole new level.